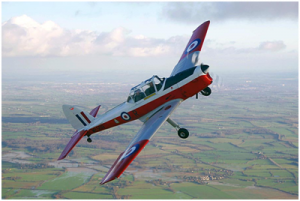 The DH Chipmunk DHC1 Mk22 was the basic trainer used for pilot training by all three services during the 1950’s through to the 1980’s. Our aircraft G-BCPU had a service marking WP973 and will be repainted in 2015 to show its original RAF livery. C1/0839 was built at DH Chester and supplied to RAF in June 1952. It was initially placed in storage until it was issued to the Liverpool University Air Squadron at Woodvale and served with the RAF until October 1974. The aircraft was then transferred to the civilian register and has been a long term resident at Booker until 2014. Flying in this vintage RAF trainer is like stepping back in time. After learning on this aircraft the post war RAF Pilots would have gone on to fly the early jets such as the Hunter or Vampire. With more sensitive controls than the Pipers and Cessnas, this aerobatic tail-dragger is like a nippy sports car with great all round visibility making it a joy to fly! This flying experience is a great gift for Father’s day or for anyone who wants to experience proper authentic old fashioned flying! Flights start at just £140 for a 30 minute flight. The comprehensive ground briefing to cover safety, emergency brief and aircraft briefing takes a further 30 minutes.